Mushrooms have all sorts of uses whether it be for decorative, dining or medicinal purposes. However, though they are useful to us, most people think that they are an eyesore and a hazard in their lawn and garden. With hundreds and hundreds of species of mushrooms, it is possible to encounter poisonous mushrooms. But, most mushrooms encountered daily in yards are not to be feared, but they should not be picked and eaten. Mushrooms require water to thrive and survive best in excess water. Pooling water, water-rotted wood and severely wet soil can all lead to an increase in the population of mushrooms. Mushrooms have no protective outer skin, so they can lose water very rapidly, which is why they only come out in wet weather and why they thrive in damp conditions, as explained in "Why are There Mushrooms in my Yard," an article from the USDA. Mushrooms are actually the “fruit” of a enormous network of fungi. The “roots” of the fungi known as hyphae attach themselves to the roots of nearby plants to form a large network of strands called mycorrhizae. The USDA explains that mycorrhizae can stretch for hundreds of feet, if not for thousands. This network of “roots” allows the fungi to transport nutrients all over, so that the mushrooms can pop up just about anywhere. Mushrooms and fungi thrive in moist conditions, so, to help curb the amount present, the USDA suggests to water less frequently and only when needed. The mushrooms that you see are not the root of the problem, but, if they are what bothers you, use a rake or a shovel to remove them--just be prepared to see more in a day or two. 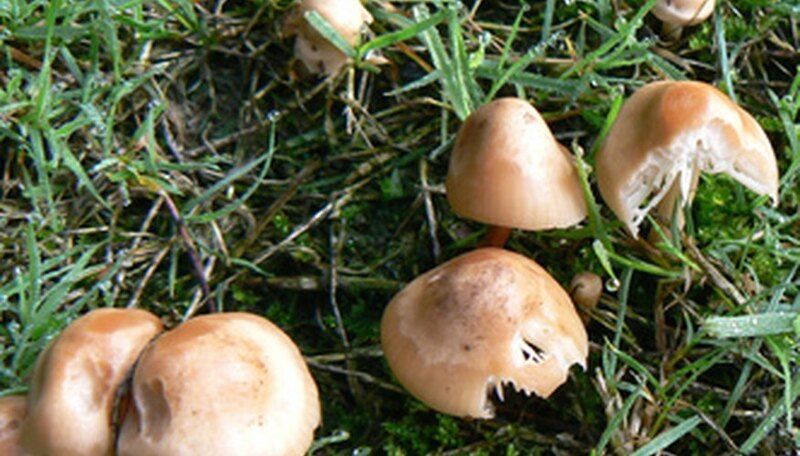 Fungicides can be used to kill off the surface mushrooms, but the mycorrhizae lives up to 2 feet beneath the surface, rendering most fungicides ineffective. There is really nothing to be concerned about when you see mushrooms in your garden or yard. According to the Gardening Know How website, mushrooms and fungi are beneficial to the environment and they play an integral role in the lifecycle of plants. The fungi break down dead plant matter into the basic nutrients it is made up of, which allows nearby plants to use it. Thus, the presence of mushrooms denotes that your soil is healthy and thriving, not that it is diseased. Mushrooms may be beneficial to plants, but that does not mean that all of them are safe for humans and animals. If you want to ensure the safety of your children and pets, you can have someone identify the mushrooms that are growing in your garden. If you still feel uncomfortable having them around, it is easy to remove them with a shovel or merely with a gloved hand. Until you know what type of mushrooms are present, it is best to wash yourself after contact so you do not get sick.